We’re in the battle of the mediums, and depending on which day you ask, determines who’s winning. More and more we hear why TV is a dying breed and everything we watch, will soon be online.That’s true. There will need to be an online presence for just about everything that happens on TV, or in our modern world, or…it’s like it didn’t happen. According to Nielsen’s Total Audience Report, about 2.6 million households are now “broadband only,” meaning they don’t subscribe to cable or pick up a broadcast signal as of December 2014. BUT don’t send your televisions to the electronics graveyard just yet. The tube isn’t going away.It’s evolving. 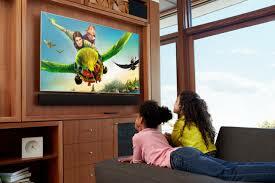 It’s become Apple TV, Roku, Google Chromecast and many more virtual ways to live stream and watch video on demand. Still, as much as TV has it’s eulogy read, people are still fighting for a space in the line up. New shows are still debuting and new experimental channels are popping up. Plus video on demand is virtually the new way to watch TV. No doubt, the competition is ON! HBO recently announced it’s HBO GO service to rival Netflix and Hulu. HBO GO gives their subscribers unlimited access to the channel anywhere and at anytime.Then, there’s my personal favorite. Broadcast News and Digital Media. Your CNN’s versus The Young Turks. Traditional news outlets versus non-traditional. I do both, and I LOVE it! I’m a reporter for a traditional news station and I host my own digital show. Our second season is being distributed by Focus Broadcasting Network, a Netflix competitor. Why do I do both? Because I love telling stories in a news format and I love the access and creative freedom you have with the online platforms.Traditional journalism isn’t going away. It’s just evolving. In the form of online content, with much more diverse storytellers. Broadcast news is still one of the key mediums that shapes people’s thoughts and perceptions of the world. Which is why is has to be handled with integrity.News reporting helps keep my story telling skills fresh. It also provides an already established platform. Broadcast news provides tools that I will continue to use on my own show.I take all of those the lessons and tools with me to the digital space and execute my vision. They help each other. It’s liberating to create your own rules on the internet. To think outside the box,and to come up with your own structure. It doesn’t mean we do away with traditional media, at least not right away. It means that we tweak it for where we’re headed.I enjoy tweaking, and staying open to both the traditional and non-traditional means of media and news delivery. What media rules are you tweaking?